A client who wishes to remain anonymous contacted our firm with an interesting problem. On a recent overseas trip to her family homeland in Friesland (Netherlands) she was surprised to learn that her Grandfather had a sister who allegedly came to America. But the family knew nothing about her or what had become of her other than the simple suspicion that she had immigrated to Grand Rapids. Had she died enroute? Did she settle in Michigan or locate elsewhere? Marry or have children? Knowing that we specialized in Dutch Genealogy the client reached out to us to find her Great Aunt Jessie. Finding womenfolk can be quite difficult when not armed with a bit more information than our client possessed. However, we took on the case and promised our absolute best. Objective: to Find what Became of Great Aunt Jessie. 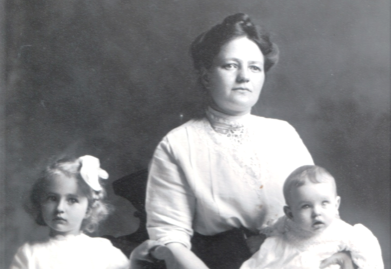 We located Jessie living in Grand Rapids under her maiden name working as a nanny for the household of a wealthy Dutch importer where she remained for about a year before disappearing. She was found in no other city directories and had been replaced in her duties as a nanny. Knowing the approximate year of her immigration we examined immigration records to and from the Netherlands in search of Jessie. We located her and found a man she apparently traveled with. Was this a family friend? It was virtually unheard of for a single female to come to America in the accompaniment of a man. So it was obvious that they knew each other, since they came from the same village, but were not romantically bound…at least not immediately. His name was Sam. 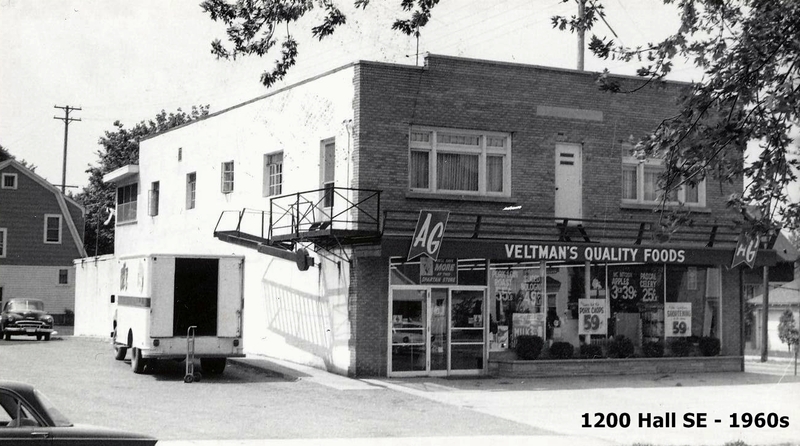 He settled in a predominant Frisian area of Grand Rapids and was likely courting Jessie over the entire year she was working for the merchant. He too was found in the City Directories, but then something strange happened. He too disappeared. And about the same time. Where did he go? Did they go together? We searched through the Christian Reformed Archives for published marriage banns or records, but nothing was found. Sam and Jessie did not marry in Grand Rapids. So where did they both go? We worked hard in our attempt to pick up their trail and through a stroke of luck we found it. A Dutch news blurb mentioned a group of Dutch who chose to head into the Alberta Province of Canada where the Canadian Government was giving away homestead land. Sam was one of those who opted for free land. Jessie too was one of the 14 people en route. Shortly after arriving in Canada the couple was married by an accompanying Minister. Sam tried his hand at farming as he was required to improve his homestead for a defined period being given both land and seed, but the land he was given was worthless and Sam found it very difficult to grow anything thereon. So he surrendered the land under penalty and exchanged it for a second plot. This too turned out to be less than desirable. So Sam abandoned this venture as well then moved to the small Dutch community in Edmonton (his friends) where he was noted as a merchant. Sam and Jessie had 4 children, 2 of whom died and are buried there. A couple years later Sam was pulled back to Grand Rapids through the advice of a merchant friend he had known when first there. We traced the family from Edmonton, across the border in Montana, and back to where they had started their journey. This time Sam was a merchant. Sam grew a profitable Dutch grocery where he catered to his Dutch kin. Jessie apparently was very sick. She had stomach cancer and passed a short time after arriving back in Grand Rapids in the family apartment above the grocery. Sam remarried when the kids were young and no-one remembered poor Jessie. Family back in Friesland did not know or forgot what fate had befell Jessie or they too would have remembered. We found her marked grave. Sam too is buried there as well as his second wife. The location where Jessie worked when first arriving in Grand Rapids is now the Wealthy Street Bakery. The location of Sam’s Grocery and the place where Jessie died is the Hall Street Bakery, owned by the same owners as the Wealthy Street Bakery. We could have stopped at this point as we had solved our objective; however, we felt pulled to find additional records, if they might be found. It was apparent that Jessie’s story was not quite over. We followed Sam’s life from his upstart grocery to his death and then the passing and closing of the grocery as his family lost interest. Sam belonged to the Christian Reformed Church (CRC), the same branch and location that abruptly left the CRC and founded their own church known as Protestant Reformed (PR). We visited the archives of that church body and found a photo of Sam sitting on the board of Elders. We also located church records for his family that revealed that descendants of his children still were in attendance to this day. We reached out a male descendant who showed no interest. We reached out to a female descendant who was the daughter of a widowed woman that had been married to Jessie’s oldest son. The woman was living in an assisted living center and we set up an appointment to interview both the widow and her daughter. What a meeting this turned out to be. Not only did we learn a lot about Sam and his family, but the daughter pulled from her bag an old photo album. The faded blue cover depicting a windmill showed its age. The family had kept this album through the years, but no-one knew who these people were! Inside were photos of Jessie and her family. Also were photos of the minister that had married Sam and Jessie, in addition to the minister’s wife and some friends back in Edmonton. Then were found photos of family on both sides (Sam’s and Jessie’s) back in Friesland. I love doing my own research on my family tree. I’m pretty good, and enjoy it immensely. I look at it like an investigation, or detective work. So, why hire Jay? He brings fresh eyes to the case, and found things I couldn’t. I was thoroughly happy with the results, and will be using him in the future, for other projects on my tree. Thank you Jay! You did a wonderful job on my 5 items. Very thorough, and even went beyond what I expected. Again, many thanks. While writing a family history I approached Mr. Kruizenga to look into some discrepancies about the background of my great-grandfather, a Dutch immigrant who had lived in the Grand Rapids area. There was conflicting data from family members, Ancestry.com, family trees, etc. I needed a professional genealogist, someone who had access to foreign records and who could translate the Dutch material and make sense of it. I also wanted the backing of a professional’s “seal of approval” on whatever was found. Mr. Kruizenga pursued the project with unexpected vigor and competence. I received four lengthy reports from him that addressed each of my questions. Not only did I get the raw data (at least 10 records of births, deaths, marriages, maps, etc.) but an intelligent and comprehensive analysis that was tailored to my quest. Mr. Kruizenga handled the entire project with honesty, competence, patience, and professionalism. It is clear that he loves what he does and is very good at it. As for the results of our collaboration, he solved a century-old discrepancy and gave me considerable additional information that I had not expected. I cannot say enough in my praise of Mr. Kruizenga. Congratulations to Diana Walstad for her perseverance to see this through. Her book has now been published. Entitled “Family History (1860-1950) of a Doctor’s Daughter” the book is available through Amazon. This is the 2nd time I have taken advantage of Jay’s services. I hired him to investigate my French roots. After a family reunion I was appalled that no-one knew anything of our French side. Jay picked up the trail taking my French roots from Grand Rapids to Chicago, from there to New York, then into Canada where he discovered I descend from the “Filles du Roi” (King’s Daughters)! What a find! And he didn’t stop there… he brought my family back to France. A client who chooses to remain anonymous contacted us with a few objectives one of which involved learning about her Great Grandfather who settled in Michigan from Canada before migrating to California where he died. We promptly picked up the trail and made the awesome discovery that the Great Grandfather was a Magnetic Psychic Doctor deeply involved in the Spiritualist Religion. We found articles and ads concerning the doctor and his run-in with the law. This was a time when modern medical practice was evolving into what it presently is. Psychic Doctors were still allowed to practice though it was becoming harder. They had to post notice with the city showing credentials and proof they had practiced elsewhere. The Great Grandfather had jumped through all the hoops but was being sued on a technicality. Furthermore, one of his patients had died allegedly due to his having prescribed a tonic that had done nothing for her. The Doctor received a slap on the wrist and a heavy fine – the first two times, before again being sued. The good Doctor took this to the Michigan Supreme Court. We found that case in the Lansing State Archives which we printed in its entirety for our client. The Doctor fled to California after the Court ruled in his disfavor. How fortunate that we located Genealogist Jay Kruizenga! Long ago we hit the amateur researcher’s “brick wall”. We had performed on-line searches in the Grand Rapids area for historical & genealogical societies, churches, cemeteries, county clerk offices, and more. Jay is detailed in communication back and forth. He knows where and how to dig deeply for a variety of information about our relatives. Additionally, Jay provided local and national history of that era – that is when our people became real. In our contract with Jay we listed the specific areas and people that we wanted Jay to research. Jay gladly utilized the information that we had already collected over the years. He said it saved him initial research time, which permitted him to go after more hidden information. We set a maximum number of hours for the contracted job – although we happily admit that we extended the contract time by ten hours when Jay found additional, pertinent, historical family information. It is amazing what can be found from old newspapers, State archives, old & obsolete cemetery records, law enforcement/court records, and more. Jay drove to various locations, even in the snow, to research information. He requested copies of documents from various agencies and resources. Jay is quite the photographer: the photos that he took of the gravestones and other locales were excellent. His investigations of the very old archives at the cemeteries proved to be the info that we needed to solve many puzzles. We live far away – we could not have done any of this footwork ourselves. In our relative’s garage we found an old, quite damaged photo. On the back of the old photo, some names were faintly penciled. We did not recognize the names – we guessed those were ‘nick-names.’ Jay helped us identify when the photo was taken – 1889. Jay confirmed the photographer and the location and assisted in identifying the five young children in that photo. Jay put all that collected detail into a concise, large, well-organized report. We recall telling Jay (when he first posted his research report on-line) that we sat excessively long at the computer – viewing his report while all the time being fully intrigued and entertained by his findings! Now that this project is complete, we miss the exchanges with Jay; we miss working together to solve mysteries together. We look forward to the future when we will again recruit genealogist Jay Kruizenga for researching another branch of our family tree. Jay is phenomenal, what more can I say! I couldn’t begin to understand how he does what he does…with speed and clarity. He was able to take my ancestry back to Holland with rich details and all in an easy to understand format. MIGenesPro has undertaken several cemetery restoration projects where we document burials and search for lost headstones buried beneath years of soil and debris. In one such case we were working the old permit grounds of the former Valley City Cemetery, now Oak Hill Cemetery South, in Grand Rapids, Michigan. This segregated section in the far southeastern corner of the cemetery was reserved for pauper burials or those who didn’t want to pay the fee to be buried elsewhere. Burials took place by section and year, cost a single dollar, and headstones were allowed. However, those buried here were not given a choice on location. Many other headstones have been recovered. A small sampling of these can be found under our “Reclaimed Graves” tab above. 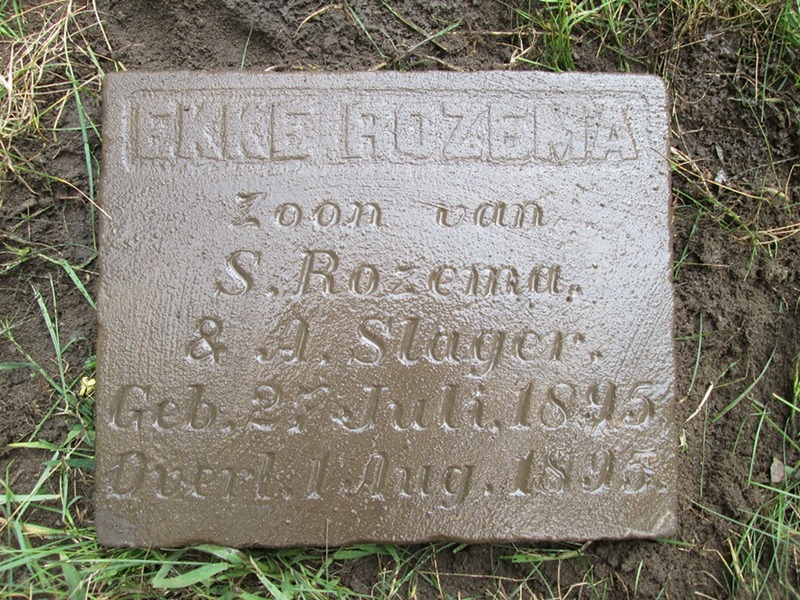 Jay, I can’t thank you enough for finding Ekke Rozema’s headstone. I am just now wrapping up a one-year genealogy effort on my grandmother and her 14 siblings, of whom Ekke was the firstborn but died after five days. The whole family has been connected to the project via a Facebook page, and we had resigned ourselves to Ekke’s marker being lost. What a fantastic thing you are doing! Thank you again! It was with amazement, gladness, reverence and deep gratitude… You did an AMAZING job in recovering and photo-documenting Jane’s stone so carefully and completely, and the epitaph is beautiful and poignant. I’m extremely grateful. Jay, you’re NOT only a premiere photographer but a ‘miner’. Thanks for digging these out. Photos are GREAT! Thank you, thank you, thank you! You uncovered the stone of Edward Paxson Stamm, my maternal great-grandfather in Oakhill Cemetery, plus added the small newspaper notice about the death of Edward. The photos and information you offered on Edward Stamm were absolute gems to me! Being adopted can often leave an unfulfilled desire to know about your roots. There are methods available to receive non-identifying information about one’s birth parents if the adoption agency is known and this information can be used to find either or both parents. Some cases are more difficult than others and DNA is typically the answer that allows breakthroughs. In a recent case we were able to find both adoptive parents using the adoptee’s DNA. Though there were no close matches we researched each match to find a common line, developing each tree back in time looking for cross-connections that might point to the birth parent. This can be tricky and its easy to jump to false conclusions. But given time and a great deal of effort this can be done. In the fore-mentioned case only after developing several lines were we able to pinpoint a more precise place to examine thoroughly. We were searching for any individual that would match the non-identifying information. And after several days of intense searching we found them. Not every story is pleasant. Sometimes a birth parent, once found and contacted, wants nothing to do with the child. Sad but true. Not every story on the popular TLC show “Long Lost Family” is aired for precisely the same reason. Sometimes, the birth parents just can’t be found. MIGenesPro has investigated several adoptions and thus far has no cases where birth parents haven’t been found. We’ve even looked into a client case concerning an adoption of the client’s grandmother. This is often a joint effort meaning that our firm can only do so much: we can find the adoption agency and draft letters, but we can’t request the records themselves, not without being a living descendant. This was the case for our client. The adoption agency that handled our client’s grandmother’s adoption had been out of business for numerous years. We searched who might be the holder of these records and discovered a newer agency that had access to them. We gave this information to our client who had to send the letter herself. And after the time allowed by Michigan law our client received the information. If you are adopted or you have a Michigan ancestor who was adopted and you desire to learn about the birth parents… fill out the form at the bottom of this page. We would be delighted to work with you in solving your mystery. Having been adopted as a baby, I was faced with many unknowns throughout my life. I was able to track down my biological parents but that was about it. I had a great relationship with my biological Mother but not so much with my Father and I hit a brick wall when I got to my paternal grandmother. I was, however, able to determine that she was also adopted. I had no idea where to turn from there. Thankfully, I reached out to Jay who was not only able to point me in the right direction, he was absolutely the reason I was able to continue building my family tree and solving many mysteries in my Ancestry DNA “family.” I am confident that without Jay’s help, I would have never been able to obtain the valuable information. I found Jay to always be helpful, professional and very timely in his responses. When looking for someone to help you with your search, I can assure you that you won’t be disappointed in your choice to seek Jay’s help. Thanks Jay… your work is outstanding and reasonable cost wise. I would certainly recommend you to friends and family. All the best! Jay found my great grandparents graves, and helped me learn that I have Dutch, French Canadian, and English ancestors going back to the 1600s in America. I never imagined I would learn so much. Beyond his great knowledge of genealogy sources, he has a unique curiosity and a sixth sense that leads to the finding of crucial details that most other people would overlook. OH MY GOSH, thank you for the envelope of the pictures and and printed package of my ancestors. A client approached us to confirm family lore. It would seem that the family was told that the ancestor, who passed at an early age, was bitten by a rabid dog. This story certainly left an impression on the family up through the ages and is remembered still. However, when we investigated this story what we discovered was completely different. We found a newspaper obit from before the turn of the century, a small listing about one inch in space, that told how the client’s ancestor had really died from diphtheria. Not all family lore is true.